In today’s competitive and volatile world, it’s up to elite individuals like you to stay the course. At Successfactory, we’re driven everyday to help leaders inspire their teams to maximise business performance and achieve the results they deserve. In these uncertain times, we need outstanding leaders more than ever. Our Bespoke Leadership Programmes will help enhance your leadership skills, craft new world strategies, and make great change possible. Register your interest in embarking on your own leadership journey today, and you’ll receive a copy of our Case Studies and Success Stories. In them, we detail how we’ve helped businesses like Samsung create cutting edge leadership programmes that help their leaders thrive. Spaces on our Bespoke Leadership Programmes are limited, so don’t miss out and register your interest today. As founder of Successfactory and one of the Uk's moust sought after leadership speaker, Graham is described by his clients as ‘an inspirational storyteller’ and ‘igniter of human potential’, Graham Wilson is a renowned global leadership expert. With decades of experience under his belt, Graham is trusted by major companies across the world to nurture their next generation of leaders, and for good reason too. Graham and his team of experienced educators and developers can work with you to design bespoke solutions to achieve your wildest dreams. You can expect innovative methods that drive personal and business results. We’ve worked with companies and leaders all around the world including Fujitsu, Samsung and Vauxhall. We approach learning as a change process and understand what it takes to become a great leader. On our bespoke programmes, we’ll help you reach your maximum potential while mastering your professional goals. 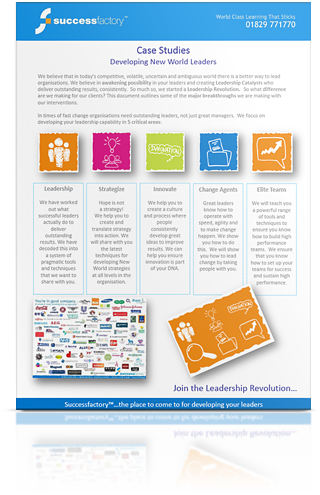 The world is changing, and many outdated leadership methods don’t work anymore. We’ll help you create compelling and coordinated strategies to drive sustained business change in your organisation, so you can achieve the results you deserve. A leader is nothing without his team. We have a range of unique team development solutions you can use to develop your team and enable them to perform at the highest level. Following his time in the military, Graham founded the Successfactory and now works globally to help the world’s largest businesses develop extraordinary leaders to reach all their business goals. Martin is a passionate trainer who’s dedicated to making sure that all his teaching techniques are relevant and up to date. He specialises in helping individuals understand their strengths and use them to drive change and ensure high-performing sustainability. Dave has extensive knowledge of the best leadership techniques out there, and strives to engage your imagination and ensure that you’re committed towards becoming the best leader possible. Nicola is an award-winning leadership coach, trainer and facilitator who helps entrepreneurs like you operate in their 20% zone - where 80% of their big results come from 20% of their efforts. Here at Successfactory we value our customers. That’s why we’re proud to say that not only do we develop more than 5000 decision makers every year, but also have a 100% customer satisfaction rate that comes with it. The world has changed, and outdated leadership methods don’t work anymore. But we’ve got you covered. We’ll help you achieve excellence with our innovative developmental techniques that’ll engage and satisfy you well after you’ve finished our programme.